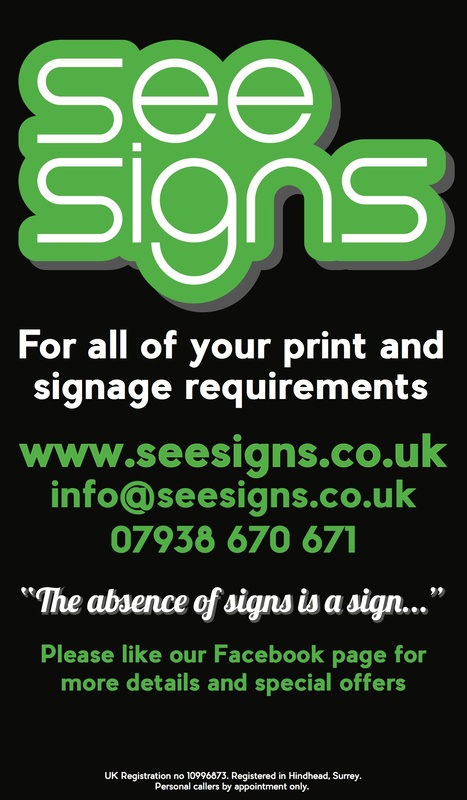 See Signs - for all of your print and signage requirements. We supply quality signage and print to get your company noticed. South East England Signs - For signs, graphics and print, Surrey, Sussex and Hampshire. Checkatrade. Litho, digital and large format. Cut vinyl graphics and lettering. Logos and decals. 07938670671 Hindhead, Petersfield, Haslemere, Grayshott, Churt, Tilford, Farnham, Odiham, Liphook, Bordon, Whitehill, Guildford, Woking. New website coming soon. In the meantime, please click on the links above for examples of our work.